This engaging course incorporates crucial challenge material right from the start, enabling students to confidently leap into Cambridge IGCSE® Science study with a solid foundation in Chemistry. It is the best preparation for our bestselling Complete Science for Cambridge IGCSE course, facilitating seamless progression from Cambridge Secondary 1 Stage 9 right into Complete Chemistry for Cambridge IGCSE. 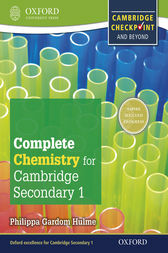 Complete Chemistry for Cambridge Secondary 1 covers allthree years of Cambridge Secondary 1 Chemistry in the same book, flowing smoothly from one stage to the next. Regular revision and extension exercises will help consolidate learning and then stretch and challenge students to reach the next level. Plus, it's fully matched to the Cambridge syllabus, so youknow it's comprehensive.